We dedicate this recording to David Baker. It represents his best—live to two-track recording—a method that makes the engineer a live performer in that whatever is caught or missed, sticks. Thinking back on those nights, what I remember most vividly is looking back at David in headphones, hunched over the mixing board, his arms splayed and head snapping left and right as he jumped on all the details flying at him. When I’d turn to make sure he knew of an upcoming solo and catch a sudden glimpse of all that intensity, I couldn’t help but smile, imagining all the neurons firing in his brain. His alertness reminded me of my dad’s hunting dogs that would quiver with excitement as they’d sit by the duck blind with their rears not quite on the ground lest they be one millisecond late in realizing their potential as a purebred retriever. Intense and eager in the same way—recording was every bit as much in David’s veins. I was lucky enough to work with David one more time in 2004 when he recorded and mixed Concert in the Garden. It was only a few months later that David died, shocking all of us. But he is so present on this recording, and I’m deeply grateful for that. When I listen to this music, David transports me back to that week at the Standard so effectively, that if I wish to see him, I just turn around really quickly, and for a brief moment, I almost can. This recording is unique in that it is comprised mainly of my early works, and contains far more ‘arrangements’ than my usual fare. The oldest pieces, written over 20 years ago at Eastman School of Music, are Bird Count, Last Season and the arrangement of My Ideal. Years later, Bird Count (a blues) closed five years’ worth of Monday nights at Visiones. One of my best memories of this piece was on our very last night there in January 1998. The club was packed, and I’d invited guys who had played with us over the years to sit in for a few farewell choruses. Bird Count bounced along, chorus after chorus, leaving Tim Horner and Tony Scherr ready to drop. I just couldn’t bring myself to cue in the final chorus that would end an era for the band. Much of this music was born before the band even existed, and the remaining pieces were commissioned by other groups and for other soloists. Later, I reshaped those arrangements to feature all the great soloists in my own band. Lately was written in 1987, just a couple of years after I moved to New York. I had in mind to give it to Mel Lewis for his band, but never did. The Willow was written as a dedication of love and gratitude to Mel. Though he was really very sick at the time, he had generously showed up to listen to one of the first rehearsals that John Fedchock and I had with the band we’d just started in 1989. On the break after rehearsing the piece, Mel asked if it was mine. I said yes, and he smiled, saying very affectionately, “I thought so.” I wanted to tell him it was for him, but I couldn’t, not wanting to let him know how deeply we were all feeling the seriousness of his illness. My teacher and dear friend, Bob Brookmeyer, was the one that had so generously introduced me to Mel. I’m grateful to Bob for a thousand things in my life musically and personally. Among them, was his kindness in asking me to contribute arrangements of That Old Black Magic and Over the Rainbow for a project that he was doing with the Cologne Radio Orchestra for the singer, Helen Schneider. Bob’s writing on that recording is beyond extraordinary, and I was thrilled but terrified. I cherish the confidence he’s always had in me. My Ideal was originally composed to feature Basie trumpeter Peter Minger, who I’d met and heard while I attended the University of Miami in 1983. When I went to Eastman, I wrote this arrangement and immediately sent it back down to Pete and the Miami band. At the same time I was introduced to the beautiful voice of Teri Koide who was at Eastman, so I made another version as a feature for her. Both schools recorded the arrangement. Frank Kimbrough is a master of ‘introductions.’ Over the years I’ve heard him do hundreds of stunning intros to Last Season, Coming About and Dança Ilusoria. I love to give him free reign, and I just couldn’t make a live recording and not capture one of these gems. I used only the introduction to Last Season and segued into the next piece. This album is like a double-exposed photograph. One layer reflects where I was from the mid-80’s up to the mid-90’s within a context of writing mostly arrangements and works for groups outside of the band. The second layer gives a much later picture—that of the band—the last week of January 2000, long after their tenure at Visiones, and with many tours and concerts under their belt. We already had made Evanescence and Coming About and were just a couple of days away from going into the studio to make Allégresse. How lucky I’ve been to have these musicians play my music. We’ve watched each other grow over the years. I’ve seen them smile at each other after solos, get lost in one another with eyes shut, or cringe after a missed note. I’ve also had the joy of seeing their contentment (though they may try to mask it) upon doing something undeniably wonderful. We’ve shared numerous knowing glances at magic moments—someone turning a phrase in a special way, the rhythm section catching a particularly infectious groove, or when collectively we all felt the band breathe as one and carry us off the ground. I wish I could edit all those magic moments and glances together and give it as a gift to each of them to remind them how incredible they are. As you listen, imagine that you’ve walked into the Jazz Standard. Everyone’s getting seated. I’m letting the band know the set-list. The saxes are all looking for good reeds ... cont. 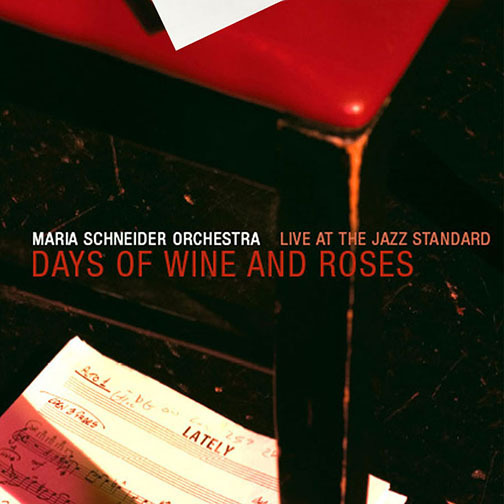 Executive Producers -- Weingut Reichsrat von Buhl, Cellars International, Inc., Enja Records, and Maria Schneider. Recorded at the Jazz Standard, NYC in January 2000.